Tarik Sedky is president of MN&P, a New York-based digital agency. Follow him @tariksed. The “reach” of banner ads is more like “misses. All that data and targeting. All that precision and insight. It’s like having a laser-guided, smart bomb system that drops an evaporating mist. The target remains untouched and oblivious. That’s why we’re on billboards this fall, not leaderboard. 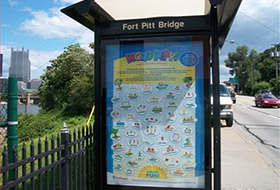 Even in seven words or less, billboards offer our client a reasonable canvas on which to make someone know and/or feel something. And, as importantly, billboards give us a fighting chance of actually being seen, and absorbed, by our audience. The original article appeared on Digiday.com. RoadNinja, the ultimate interstate travel app that shows users what’s coming up at the next exit, is using social media and digital billboards to highlight the best ninja costumes this Halloween. 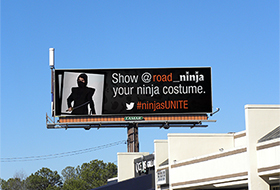 People can tweet a photo of their ninja costume to @road_ninja with the hashtag #ninjasUNITE, and it will appear on a digital billboard.